Christmas will soon be here – or maybe it won’t depending on what time of year you’re reading this review; anyway what we have here is another festive online slot and this time it’s developed by Random Logic. 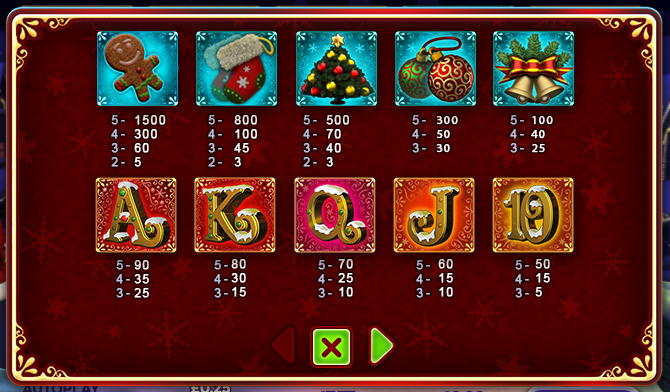 It’s called Santa’s Super Slot, it comes with a progressive jackpot and you can read all about it below. 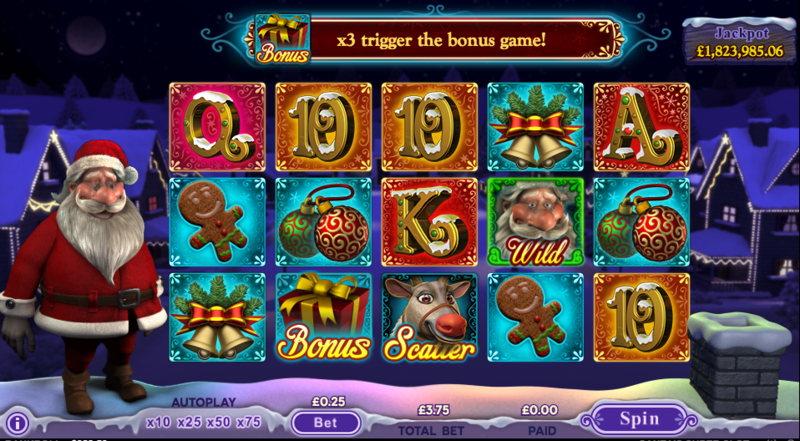 Santa’s Super Slot is a five reel slot with three rows and fifteen fixed paylines; those colourful reels spin against a backdrop of snow-covered houses decorated with seasonal lights. Father Christmas watches over proceedings from the left hand side, occasionally chucking a snowball at you. There are five festive high value symbols including a gingerbread man, a Christmas stocking, a tree, a pair of baubles and some bells; 10, J, Q, K and A make up the lower values. Santa is the wild symbol and he will substitute for all others to form winning combos except for the gift bonus and the reindeer scatter icons. This is triggered by landing three or more of the reindeer scatter symbols anywhere in view; the number of spins is not set but increases with more triggering symbols – in the video above we received 15 for three scatters. Extra sticky wilds are added to the reels during the spins and these can change position occasionally. You can’t retrigger any more spins from within this round. Trigger this by landing three of the gift bonus symbols on reels two, three and four; you now get to play a two stage picking game in which you will find multipliers which will be applied to your total bet. You can see the jackpot total ticking upwards in the top right hand corner and it’s awarded randomly in this game although a higher bet will increase your chances of hitting the big bucks. Santa’s Super Slot comes with lots of festive spirit and a real Christmas atmosphere; there’s certainly some big wins to be had in the free spins round and the progressive jackpot is always a hit with us. The RTP varies between 93.02% and 95.02%.